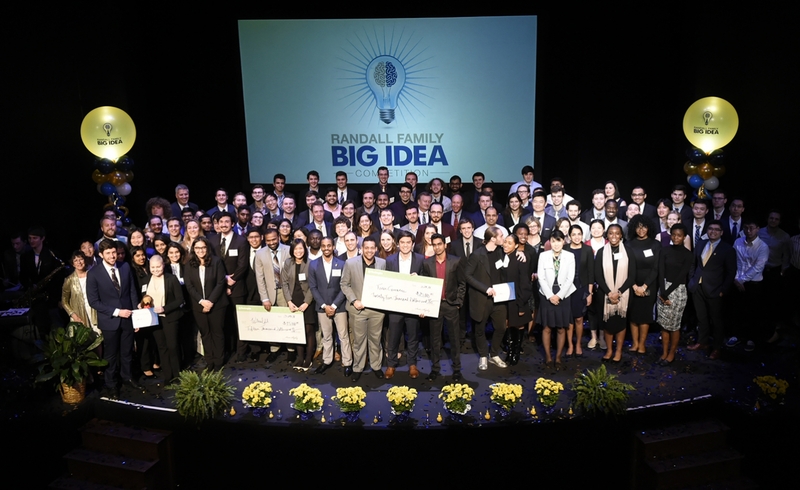 Finalists gather onstage amid a shower of blue and gold confetti at the close of the March 29 Randall Family Big Idea Competition awards celebration. Student finalists take center stage in the Charity Randall Theater on the University of Pittsburgh campus to close the 10th anniversary Randall Family Big Idea Competition awards celebration. The Big Idea Competition is the region's largest student innovation and entrepreneurship competition. Forty teams of Pitt students competed for $100,000 in cash prizes to advance their innovations at the March 29 final event. Pitt trustee Bob Randall (A&S '65) shares a smile with son Brett, daughter Robin and Chancellor Patrick Gallagher prior to the 10th annual Randall Family Big Idea Competition awards celebration. 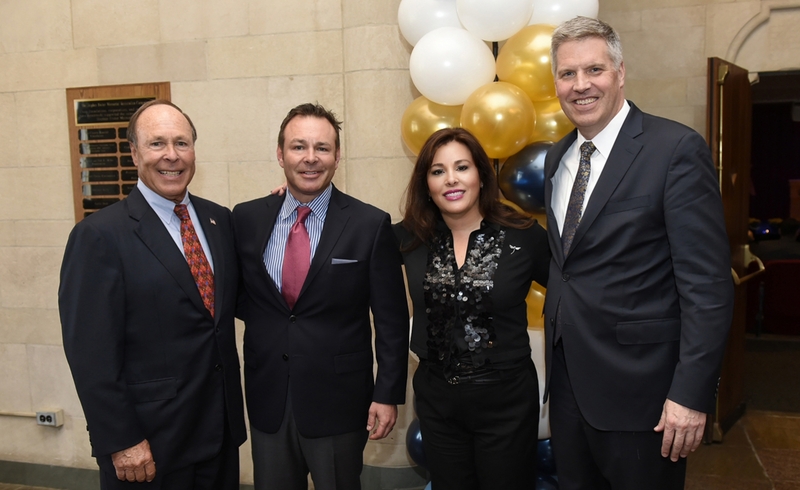 The Randalls' new $2 million gift to create a Big Idea Center at Pitt's Innovation Institute was announced at the March 29 event. 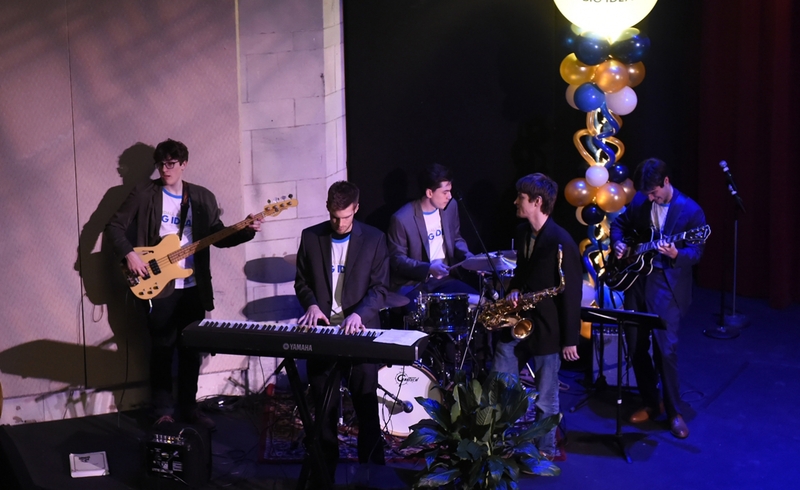 The Allies of the Boulevard — Pitt students Eli Kauffman on bass, Alex Landis on piano, Daniel Leon on drums, James Misner on sax and Charlie Falbo on guitar — added musical swagger and swing to the Big Idea celebration. 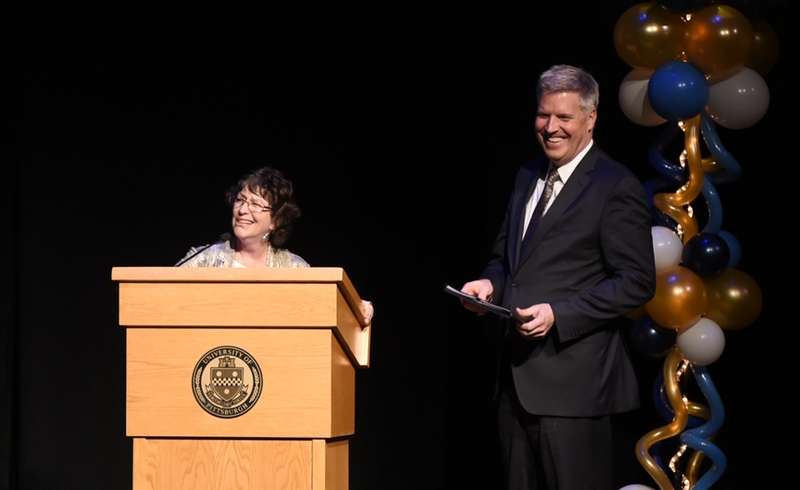 Babs Carryer, director of education and outreach at Pitt's Innovation Institute, welcomes Chancellor Patrick Gallagher to the stage for opening remarks. 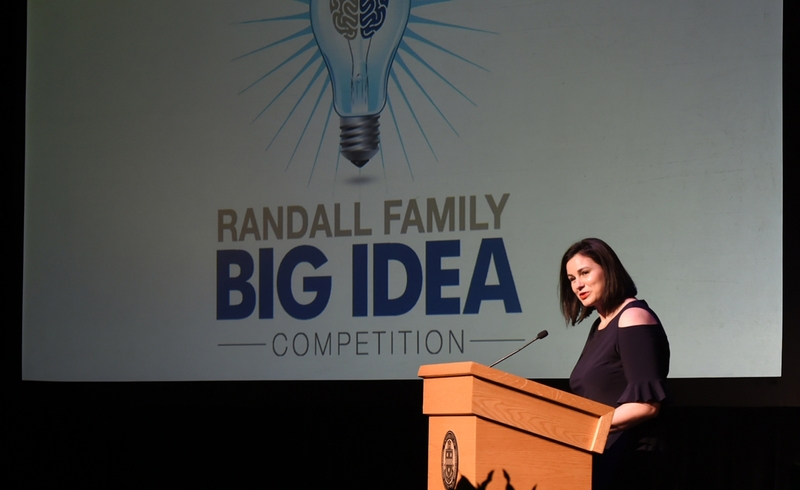 Susan Dorff, manager for student programs at Pitt's Innovation Institute, had the honor of announcing the 2018 Randall Family Big Idea Competition winners. Will Chastka (left) and Huaxia Chen (right), members of team AdventureHound, give Susan Dorff, manager for student programs at Pitt's Innovation Institute, a peek at their new site. AdventureHound's business idea, DeerBnB, is a booking software platform that will connect hunters with a network of private landowners and supporting industries to facilitate more successful hunting. 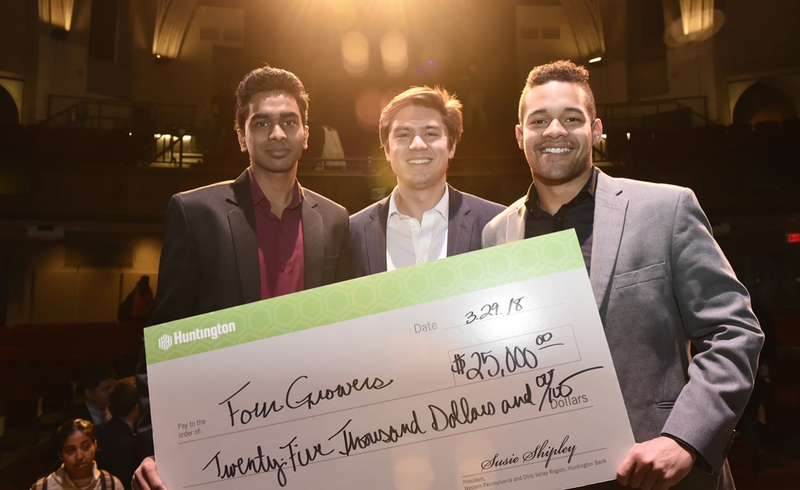 Four Growers team members Rahul Ramakrishnan, Brandon Contino (ENGR '17) and Daniel Garcia, a senior in neuroscience, show off their $25,000 Big Idea grand prize check. The team is developing a tomato harvesting robot for use in greenhouse farms. 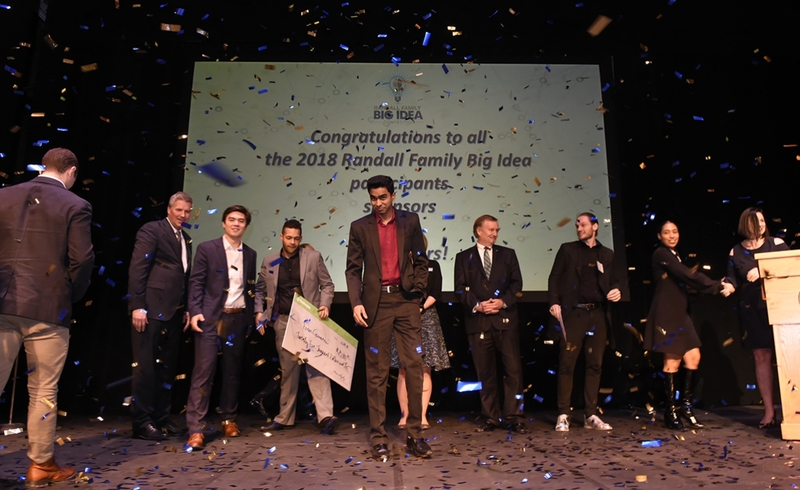 The Randall Family Big Idea Competition — open to Pitt students from first-year to postdoc — is the region’s largest student innovation and entrepreneurship competition, and this year’s program was the largest ever. The competition encompassed 300 students from 13 different schools within the University — a nearly 40 percent increase over past years. The 40 finalist teams vying for $100,000 in cash prizes to advance their innovations were selected from an initial field of 105 teams, said Babs Carryer, director of education and outreach at the University of Pittsburgh Innovation Institute. This year’s participants were balanced evenly male and female; just over half — 55 percent — were undergraduates. Half of their innovations were healthcare related, including medical devices, diagnostics, assistive technologies and health-related information technology solutions. 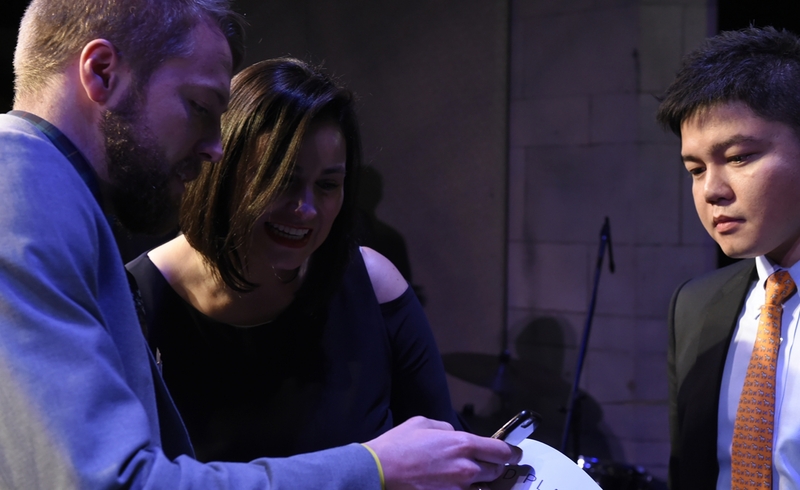 Their big ideas were distilled into brief elevator pitches — “How to say what you’re doing and why it’s important in 60 seconds or less,” Carryer said — and illustrated through videos that are posted here. On the day of the awards celebration, finalists made their pitches to a panel of outside judges who determined the cash prize winners. Someday in the near future, the tomatoes grown in greenhouse farms may be harvested by a robot developed by a team of University of Pittsburgh students — a team whose early success stemmed from the vision of a former window company executive. That former CEO, Bob Randall, is a Pitt alumnus whose passion for entrepreneurship education, one might say, is increasingly bearing fruit. About half the fresh tomatoes sold in the U.S. today come from greenhouse farms, said Daniel Garcia, a senior neuroscience major at Pitt. He presented his well-honed, fact-filled elevator pitch to a full house at the 10th Annual Randall Family Big Idea Competition awards showcase. In the protected greenhouse environment, tomatoes are nurtured under optimal conditions, but harvesting is painstaking, labor-intensive and expensive for this $2 billion industry. Labor is the biggest uncertainty. Garcia, of Four Growers, is confident in the company’s automated solution that can identify and pick ripe tomatoes. The innovation is attracting the attention of the greenhouse industry. And the young innovators are attracting attention in student entrepreneurship competitions. Team Four Growers is a product of Pitt’s student entrepreneurship programming, coordinated by the Innovation Institute. Before taking on the Big Idea Challenge, the teammates participated in Pitt’s Startup Blitz weekend and Blast Furnace student accelerator program. Second place: OcuDerm, Re-Vision and Wheel Fit ($15,000 each). Third place: Adventure Hound, Aqua Bio-Chem Diamond, MeBot and PCA Buddy ($5,000 each). Fourth place: OtterIV, Steel Town Retractor, Glucaglin and I 2 Iconic ($2,000 each). People’s choice best video award: EXG H+ Technologies ($2,000). Student entrepreneurship at Pitt has been accelerating in the decade since Pitt trustee Bob Randall (A&S ’65) and his family instituted the Randall Family Big Idea competition and its related experiential programming, based on their belief in the value of developing students’ entrepreneurial skills regardless of their intended career plans. “Equipping Pitt students with entrepreneurial skills and mindsets is critical to preparing them for success in the real world, whether they intend to launch their own enterprise or lead innovation initiatives inside a larger organization,” said Randall, former president and CEO of window and door manufacturer Three Rivers Aluminum Company (TRACO). As part of the Big Idea event, the Randall family’s expanded commitment to student entrepreneurship was announced: a seed gift of $2 million to launch a Big Idea Center. From within the Innovation Institute, the center will offer new resources, increased mentorship and a physical space for incubation activities for students of all levels and all disciplines. The new center “builds on the momentum from this competition and will create a larger vision for student innovation and entrepreneurship on campus,” Chancellor Patrick Gallagher said. “The center’s inclusive innovation and entrepreneurship programming will benefit students whether they decide to take their talents to big companies or small startups, to nonprofits or to academia,” he said. The value goes beyond dollars and cents. Randall expressed surprise at the amount of diversity among students participating in the competition, a benefit he hadn’t envisioned at the start. “There’s cross-pollination,” he observed. “The cross-pollination not only of different disciplines within the University, but diversity from different cultures. It’s amazing,” Randall said.